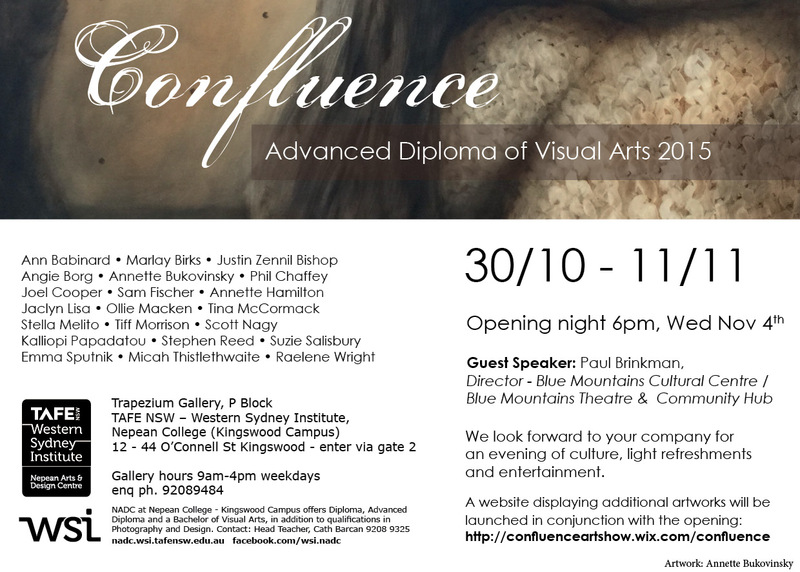 Students of Nepean Art and Design Centre at Kingswood TAFE have had a busy year honing their artistic talent in the Advanced Diploma of Visual Arts course and the results of their efforts will be unveiled at their end of year exhibition opening at the Trapezium Gallery on Wed November 4th 2015 at 6pm. 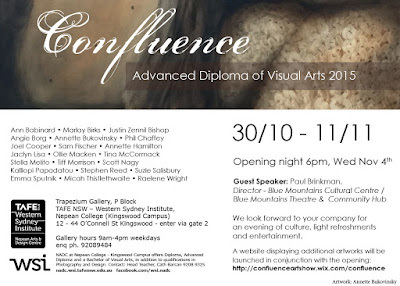 Confluence is the culmination of two years' study across the art mediums of drawing, painting, photography, ceramics and printmaking - students have refined their skills and revealed their talents under the guidance of teachers and look forward to showing their major works - a nerve wracking but very necessary process on the road to professional artmaking, and entry to Bachelor of Visual Arts at NADC in 2016. The exhibition will be opened by Paul Brinkman, Director - Blue Mountains Cultural Centre / Blue Mountains Theatre & Community Hub, and light refreshments and drinks are complimentary.